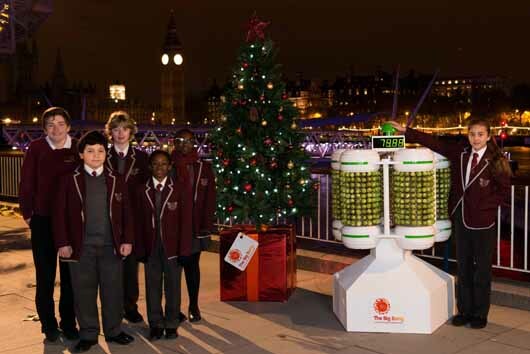 You want a Christmas-related science story to promote the Big Bang UK Young Scientist and Engineering Fair. Pretty obvious response … you create a Sprout-power Christmas tree, don’t you? Which has been occupying some of the team here at Hope&Glory over the past couple of weeks. The result of some extensive testing, some work with the lovely people at DesignWorks and some serious media selling during the day has been that our “launch” of the world’s first Sprout tree – the vegetables power the lights on the tree – has done pretty well across the media. So far, national coverage includes a spot on DayBreak (awesome!) and pieces on (or in) Daily Mail, Daily Star, The People, Daily Telegraph, ITV news, METRO, Yahoo, TreeHugger, Gizmodo, AOL, MSN, Inhabitat and … happy days from a shareability perspective … PSFK and Mashable.